This award honors Dwight Munson Moore, long-time Arkansas botanist; Professor of Botany for more than 40 years at the University of Arkansas, Fayetteville, UA Monticello, and Arkansas Tech; Chairman of the Department of Botany, UAF, 1926-1950; and author of the Arkansas Forestry Commission publication, Trees of Arkansas. In his long and fruitful career, Dr. Moore taught and inspired several generations of college botany students throughout our state. The Dwight Moore award is given on the occasion of outstanding achievement in either research or publication on Arkansas botany. 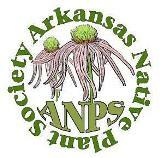 The Carl Amason Award honors a man whose character and achievements reflected the best aspirations of the Arkansas Native Plant Society membership. With unfailing energy and high spirits, Carl led field trips, shared plants, and wrote articles and accounts for Claytonia. He was a charter member, a past president, and auctioneer. His efforts on behalf of ANPS earned him universal acknowledgment as a most beloved and successful ambassador for the conservation and preservation of nature. The Carl Amason Conservation Award is given periodically to individuals whose personal efforts help all of us to conserve and enjoy nature’s gifts. The Award will include an appropriate monetary consideration not to exceed $1000.